Today’s companies are becoming more decentralized. Your top account might be headquartered in San Francisco, but your champion actually lives in Austin. 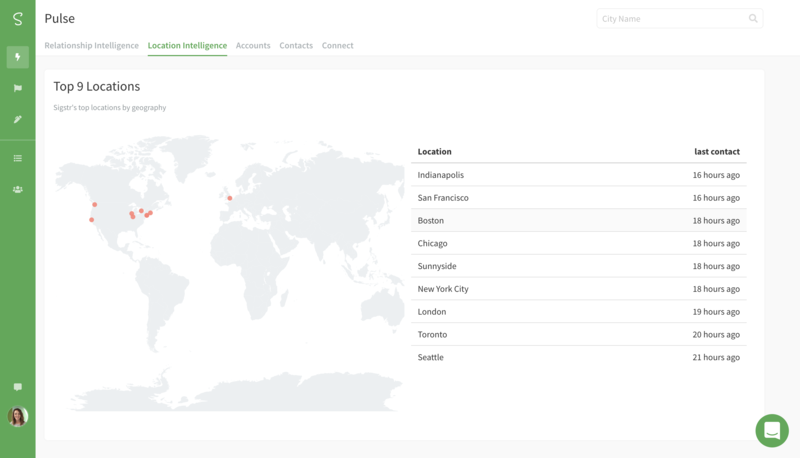 Sigstr’s location intelligence accurately informs sales and marketing where their most important contacts actually are to help them align on outreach, field events, and territory planning. Perfect Your Guest Lists - Location intelligence shows you everyone your company knows in a geographic radius. Sort by relationship strength to invite your strongest contacts to your next field event. Make Travel More Productive - Never say the words, “table for one,” when you’re on the road again. You can explore your company’s network of relationships and get warm introductions to people in those regions from your coworkers that know them best. Drop a Pin on All Contacts - Keeping contact locations organized is impossible. 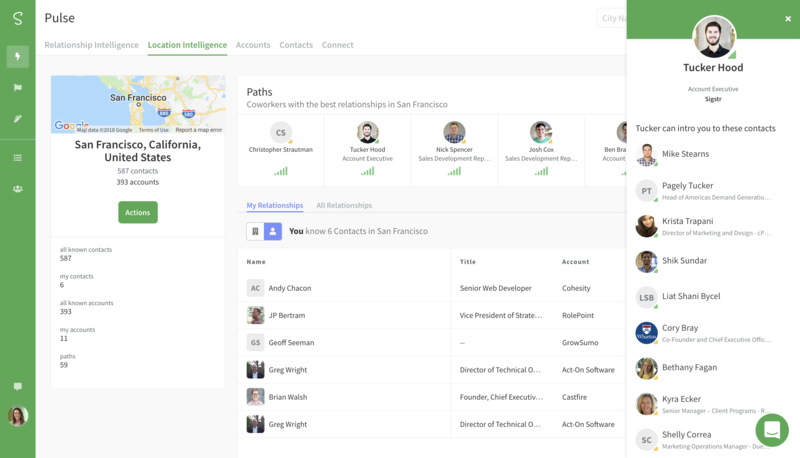 Sigstr Relationships keeps track of where your contacts are so you don’t have to. Plan Better Territories - Deciding where your field events or roadshows should happen requires a lot of guesswork. Sigstr Relationships aligns your outside sales and marketing planning to align with your contacts’ locations. Generate Lists - Sigstr Relationships makes it easy to generate location-specific lists based on relationship criteria. Event marketers can export these lists or sync them to a marketing platform to execute intelligent, location-based marketing tactics. Find New Friends - Type in any city and, like magic, Sigstr Relationships will show you every contact (and their associated accounts) that live in that area. 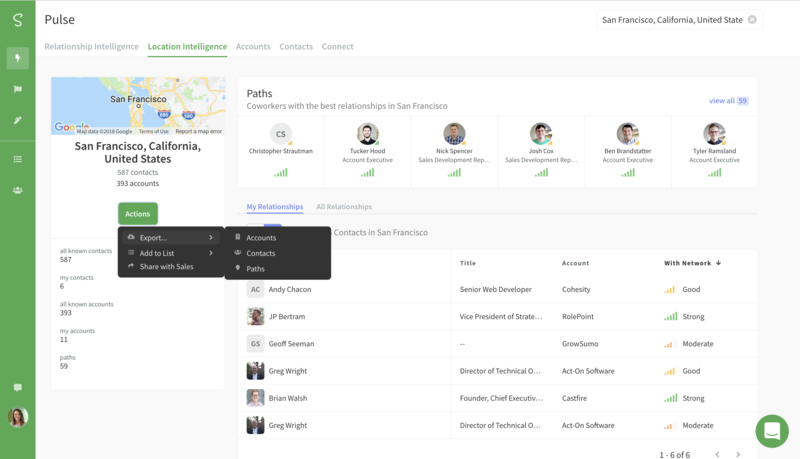 Discover contacts you didn’t know you had, make introductions to neighbors, and orient your teams around locations effortlessly and accurately. Type in any city in the search bar. Look through your paths and relationships in the area. Click on a coworker's name to see a full list of everyone he or she can introduce you to in the city. To export a list for event invites or other marketing purposes, click on the actions button and then select whether to export the accounts, contacts, or paths associated with that city. 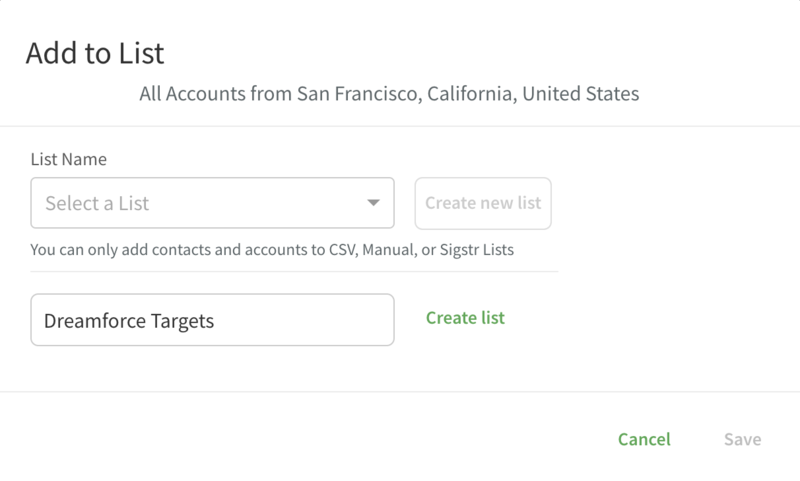 To keep the list in Sigstr, click Add to List and then choose to create a new list or add the accounts or contacts to a preexisting list. Align the list to an ABM campaign if you wish.